In 2013, five ninth grade students in Denmark conducted an experiment for a national science fair which found that cress seeds located near two Wi-Fi routers failed to germinate. "European acclaim for grade 9 experiment." Nyheder, May 17, 2013. "Can WiFi Signals Stunt Plant Growth? ... A Danish science experiment by a group of 9th-graders has gained worldwide interest and may have us rethinking the proliferation of wireless devices in our homes." ABC News, May 24, 2013. "Deense leerlingen verbazen wetenschappers met Wifi-experiment." DeWereldMorgen, May 28, 2013. "Le Wi-Fi mortel pour les graines de cresson? Attendons l'expérience scientifique." Slate, May 31, 2013. "Wi-fried: do wireless routers really kill plants?" The Guardian, Dec 17, 2013. The story went viral on the Internet. More recently, students in a few countries replicated the findings of this study, but pundits dismissed the results. In a newly published peer-reviewed study, Drs. Cammaerts and Johansson conducted a partial replication of the original Danish student study using cell towers instead of WiFi routers as the source of wireless radiation. They found that cress seeds located 200 meters from two cell towers failed to germinate. They concluded that "wireless technology may effectively and seriously impact nature and should urgently be used much more cautiously." Cammaerts MC, Johansson O. Effect of man-made electromagnetic fields on common Brassicaceae Lepidium sativum (cress d’Alinois) seed germination: a preliminary replication study. Phyton, International Journal of Experimental Botany 2015; 84: 132-137. Under high levels of radiation (70-100 µW/m2 =175 mV/m), seeds of Brassicaceae Lepidium sativum (cress d’Alinois) never germinated. In fact, the first step of seeds’ germination ‒ e.g. imbibitions of germinal cells ‒ could not occur under radiation, while inside the humid compost such imbibitions occurred and roots slightly developed. When removed from the electromagnetic field, seeds germinated normally. The radiation was, thus, most likely the cause of the non-occurrence of the seeds’ imbibitions and germination. Imbibition is a special type of diffusion when water is absorbed by solids-colloids-causing them to enormously increase in volume. It would be tempting to just discard such observations since they have not been performed under controlled conditions, thus not following all the rules of sciences. But often, observations done outside of the regular laboratory environments are the start of new discoveries. So, we decided to try to replicate the girls’ work. organism (Cammaerts et al., 2011). Such waves have also been shown to impact plants (Roux et al., 2008; Haggerty, 2010), at physiological and ecological levels. Four identical series of seeds of Brassicaceae Lepidium sativum (cress d’Alinois) (same quantity, quality, origin, age) were deposited on identical compost (same initial sample), each one in an identical tray (20 cm x 15 cm x 4 cm). Compost is the commonly used material for obtaining germination of seeds. The compost was humidified with same quantity (100 ml) of the very same tap water. Two of these trays were set at a place where the electromagnetic field reached an intensity of 70 - 100 µW/m2 (= about 175 mV/m), this being mainly due to the presence of two communication masts at about 200 meters of distance (Fig. 1). The two other trays were set at another place where the electromagnetic field had an intensity of about 2 - 3 µW/m2 (= 30 mV/m). These two series of seeds, set under low radiation level, were used as the control sample. since the existing electromagnetic fields were generated by communication masts, the frequencies of the emitted waves were 900 MHz and/or 1,800 MHz. After four days, the seeds set under the two different electromagnetic field strengths already differed: those under the lower level had begun to germinate while those under the higher level of electromagnetic field had not at all done so. After seven days in total, many seeds maintained under low level of exposure had completed their germination and other ones were in the process of their germination while the seeds set under the higher level of exposure appeared unchanged (when looking at them from above) (Fig. 2 A). The experiment was continued until a total of 10 days with, at that time, the same results as above: normal germination for the seeds under low radiation, apparently no germination for those set under the higher radiation. The fact that man-made electromagnetic waves probably have adverse effects on living organisms is actually more and more realized and admitted. Reviews on the subject exist (Pakhomov & Murphy, 2000; Fragopoulou et al., 2010; Sivani & Sudarsanam, 2012; Cucurachi et al., 2013). On October 10, 2015, the Santa Clara County Medical Association Alliance Foundation sponsored a forum, "Wireless Technology and Public Health: Health and Environmental Hazards in a Wireless World," at the Mountain View Center for Performing Arts in Mountain View, California. 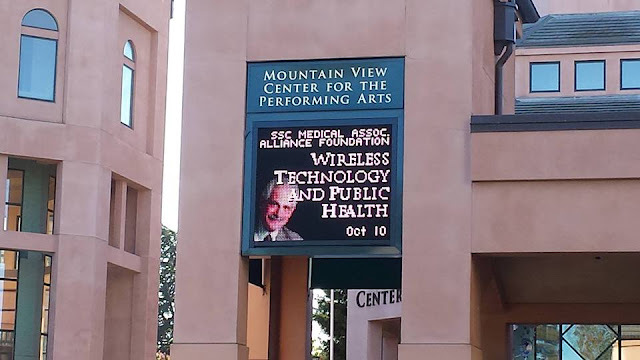 The event brought together leading experts from various disciplines who presented current scientific research regarding the health effects of electromagnetic radiation from cell phones, Wi Fi and other electronic devices on biological systems. 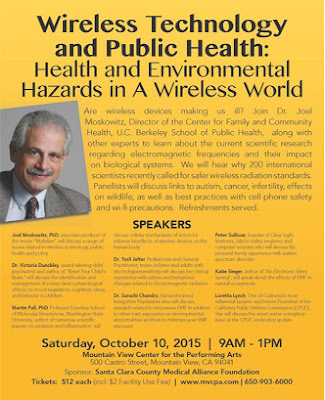 The experts presented the science and personal stories behind the recent call for safer wireless radiation standards by over 200 international scientists. Links to autism, cancer, infertility, adverse effects on wildlife, cell phone safety and Wi Fi precautions were discussed. The forum was videotaped and can be viewed online. See links below. Joel M. Moskowitz, PhD, Director, Center for Family and Community Health, U.C. Berkeley School of Public Health, associate producer of the movie “Mobilize: A Film about Cell Phone Radiation”, discussed new research related to wireless technology, public health and policy. His website is a valuable resource for journalists and the public. In the past year, he helped organize the International EMF Scientist Appeal (EMFScientist.org) signed by more than 200 EMF scientists and consulted on the Berkeley cell phone “right to know” ordinance. Martin Pall, PhD, Professor Emeritus, School of Molecular Biosciences, Washington State University, author of numerous scientific papers on oxidation and inflammation, discussed the cellular mechanisms of action that explain the adverse biological effects of wireless devices on the human body. Suruchi Chandra, MD, Harvard-trained integrative psychiatrist discussed stressors on the developing nervous system, childhood developmental delays, research related to microwave EMF and other toxic exposures, and how this knowledge changed her approach to clinical care. Toril Jelter, MD, pediatrician and general practitioner who treats children and adults with electrohypersensitivity, discussed her clinical experience with autism and behavioral changes related to electromagnetic radiation. Loretta Lynch, JD, attorney and former President of the California Public Utilities Commission (CPUC), discussed corporate influence in government, profiteering and the smart meter issue at the CPUC. Ms. Lynch served the CPUC through California’s energy crisis fighting manipulation of energy sellers. The forum was organized by Cindy Lee Russell, MD, Vice President of Community Health, Santa Clara County Medical Association.